Elizabeth, the Joyful Manifestor was invited to speak to a Le-Vel Team Call to teach them about Manifesting Business Success. She gave them very specific strategies on how to use the three laws (Law of Creation, Law of Attraction & Law of Allow) to build their down line teams. Additionally, she helped them to discover how to overcome obstacles that keep them from meeting their goals. Elizabeth, also, uses the Le-Vel Thrive products to help her with energy and weight loss. She is not selling the products but was given an affiliate link for the products. You can see them here: http://www.evarian.le-vel.com. During this call, Elizabeth discussed why she created and how to use her “My Business IS a Success Adult Coloring” book found on Amazon. Okay, so hang on one second because I’ve got to get my phone whipped up here. Guys, I have a friend and she is a new thriver, and she’s actually, I’ve got to tell you a little bit of a background on it, is that her dad attends church with me, or at my church. He started coming a couple years ago and he would sit with me during services. I just love him to death, and then he kept talking about his daughter, kept talking about his daughter, and I don’t know how we came to be friends on Facebook. So, for the last year we’ve been friends on Facebook, and we finally sat down and met a couple of weeks ago. I just love her, she’s so full of wisdom and she’s humble and she has a lot of great things that I think she’s going to help me with, and I hope that I can help her with things, too. So, it’s going to be a mutual, wonderful friendship that I’m so looking forward to having. So, I’m going to actually shut my pie hole, and I’m going to bring on Elizabeth and she is going to share with us some really, really great things about manifesting success in our business. Hang on, let me make sure I can get that up. Hey, okay, so Elizabeth are you there? I am here. It finally let me in, yay. Yay, all right, take it away. All righty, well last night Tina was a blessing to me, because it was the first time that I had shared in a group setting about the laws of manifestation. Prior to that it was just me and a camera, which is way easier, because you don’t get people staring at you with their eyeballs. Her being there was a great blessing, and I even showed off my thrive stickers on my legs to show that I’m doing the program, and I’m very grateful for our introduction, because she’s definitely helped me and I’m loving the product. But, what she asked me after hearing me speak last night, is saying how does this laws of manifestation, how can it help her and you all, help her team. I said, “Well, that’s easy.” First of all, a lot of people they may have heard the term manifestation, but they don’t realize there’s three laws of it. They’ve heard of maybe one of the laws, which is law of attraction, or they’ve heard of The Secret, which is a movie that mostly focuses on the law of attraction. The three laws are law of creation, law of attraction, which is of course The Secret, law of allowing, which is the most difficult law for many people. But, you can think of it as the let go, let God. Believe it as is. Acknowledge that it exists, it’s coming to your presence, but you don’t need to focus on how to make it happen. You let go during the law of allowing. The second thing I want you to know besides those three items is a little bit about myself. I have owned and operated a website design development and internet marketing firm since 2001. Marketing has always been my passion, however, having said that, I do marketing for my clients like crazy. I have an entire team. We’ve got processes setup in place, but like the shoe maker, I don’t do it all for myself. I’m like the kids of the shoe maker, I get plenty of calls and prospects coming in because of the very principles that I’m going to be showing and sharing with you tonight. The law of attraction with manifesting, I have been deliberately manifesting since I was about eight years-old, and I’m 46 now. It’s never ending, never stop learning, but it’s always bringing experiences, people, sales, clients, and material items to myself. So, when Tina asked me to speak with you guys, I thought well, what would be the good action items to take away and just give you some meat, and not just some fluffy pieces of this is what the laws are. I know that the sales part is what you focus on, because that’s your bottom line, but for me my favorite two words is passive income. The way I get passive income is by having members of my company that I call a team but most people would call employees, doing the work for me. For you, it’s building the team. That’s your passive income, and that to me would be very important for you guys to focus on. I thought, since we only have a short few minutes, that I would focus the three laws and actual steps that you guys can use to create and build your own teams. It’s not stuck to just these few items, but it’s enough to get your feet wet, get in there, and if you only did these steps that I’m giving you tonight, it will work. It is fantastic. The first law I told you was law of creation. This is a law a lot of people kind of fluff over because, again, they focus on the movie The Secret that doesn’t really go into the meat of it. What the law of creation is, it begins when you make a decision. You all made a decision to be on a team, now you have to make a decision that you absolutely want to build this team. It’s a desire. Now that you’ve made that decision, you need to be very specific. How many team members do you want. By what date do you want to see these team members show up? You can create and recreate the law of creation, these intentions, over and over again as you stretch your comfort zone. Two things to keep in mind is number one, it’s not a wish. I wish I was a 123 pounds by tomorrow. I am down from 186 and today I’m at 168, but to get to 123 by tomorrow, my own belief system doesn’t align to it. So, how many people on your team by a certain date can you believe that you can obtain, without knowing how, how many. In addition to that, how many people on your team do you want to be working with right now? A lot of people will say, “Oh, well, I want 100 people on my team in three months.” That’s actually possible more than some people realize, but are you comfortable, do you have the skill set and the ability? So, if not 100 people, start with 10, 5, 20, however many your comfort zone is. There’s no wrong answer. Then, when you get the 5, the 10, the 20, then you go for the 100, the 1000, etc. I’ve actually worked with people in network marketing years ago that had 10000 down line in Lia Sophia, so it is possible in network marketing. The second thing with law of creation is be specific about what type of people. In sale we say go for the numbers. In law of attraction, it’s who do you want to attract? In my business, I write out very specifically I want clients who are easy, relaxed, and fun to work with. It’s my time, I want to enjoy the people I’m working with, right. I want also people who value my time with fast payments and big budgets. For you, your team building focus may be, I am adding people to my team who are excited and hungry for the sales. They’re excited about the products, not just sharing it with friends and family, but they are so comfortable going up and talking to complete strangers. In fact, they attract complete strangers coming up to them all the time. The part that you should really get excited about for the type of people that you attract to your team, they show up and produce sales, building their own teams beyond your wildest dreams. How amazing would that be, to build your team with people who are excited to build their own team, and your bottom line is increasing. You’re enjoying the people that you’re working with. So, that is the first law, the law of creation. Making the defined moment and being determined that you’re going to believe it, you’re going to write out exactly what type of people you want, and the amount of people by a specific date. What you want to do is think about your favorite television show, or your favorite movie. It’s a scripted out, you know, it has a, it can come in the middle of it and you already know you haven’t missed out on anything if you’ve seen it many times. That’s what you want to do. It’s not the how. You’re not going to visualize how you’re meeting these people. You’re not going to visualize the meeting of them. You’re going to jump right into that middle of your favorite movie of you building your team. That’s going to be having the fun part of you enjoying watching them start selling their own products. You, educating your team of 5, 10, 20, 100, 10000 team members. You having the excitement of building them up and getting them … having the excitement of building them up and getting them the information, holding their own team calls. It’s you sharing the emotions and the thrill of hearing them get their first sale or having their first team member underneath them asking you, “What do I do next?” And as you play that scene out daily, just live it, then you’re going to get excited no matter what. You’re going to leave the house excited and on fire and you have that visualization that’s connected to the creation. 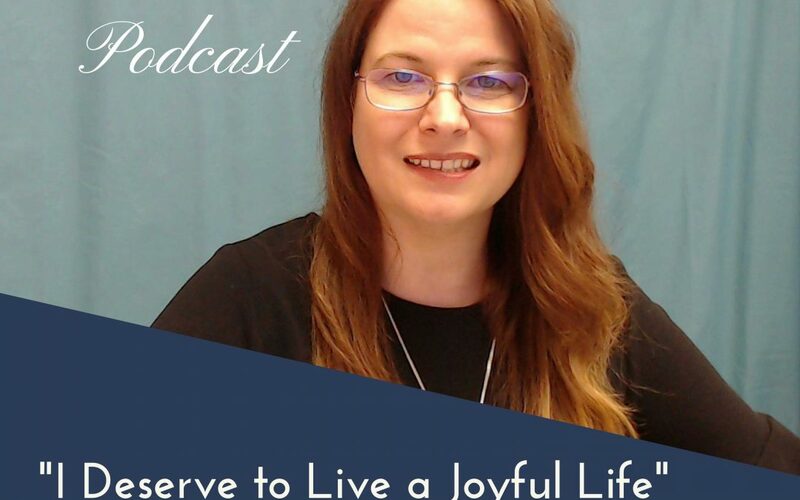 The other thing you can do, and this is part of what I do in my new business, Live Joy Today, is I create affirmation products. And I do that because affirmations are very important. Having them in your vision or in your home, things that you do activity-wise … I have clothing with affirmations on, journals, etc. They help your mindset to stay focused on what you’re believing for. So I created a coloring book called My Business is a Success. So some people have difficulty holding visions, so they can be coloring, which keeps their mind distracted from phones, from the technology. You can shut yourself away. It’s meditative, and you’ve got an affirmation, like new customers show up daily, or people refer my business regularly. It helps keep you positive. Make the note, if you start doing affirmations, if there are any fears that pop up because those are limiting beliefs or past experiences trying to dictate your present, something I was talking to Tina about earlier today. No matter what your experience says in the past, close the chapter to it. It doesn’t exist anymore. If it does, it affects your present. If you believe that people … you’re fearful to talk to people, you’re going to always be fearful. If you believe people are not going to show up to be part of your team, then they’re not going to show up. If you close that chapter and you get excited about “Who’s showing up, who am I going to meet? Oh I’m so excited for …” insert whatever … then the past doesn’t dictate the present and you’ve just closed the door to an obstacle that’s in your way. Or like I spoke last night, an invisible, hidden driver. 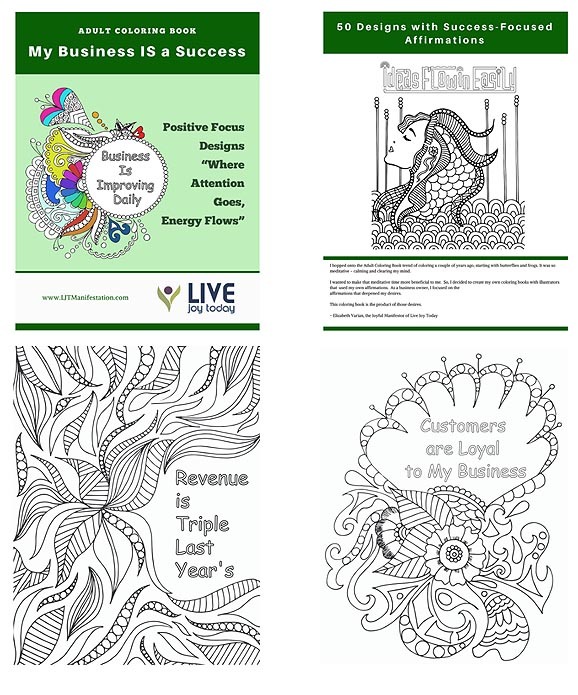 So having the coloring books help you to keep your mind from being distracted, and they keep those positive messages that are focused on exactly what your desires are, which is building your business. I know I want to keep this short and I’m keeping mindful of the time. The last thing is the law of allowing. People have a difficult time with this because what do we as humans want to do? We want to control everything, especially women. I mean, come on. We want to control the task. This is how it is. How many times do we tell guys, “Well I want this, but can you do it this, this, this, and this way? Oh and don’t forget to go over here and get this.” Like, I was gonna forget. We want to go, oh wait, wait, let me take that back and do it again. Let it go. Once you’ve done your visualization, you’ve set it in stone, you’ve made it determined, you’re focused, you’re excited on it, let it go as if it is already done. And many times in teachers with law of attraction will say, “Act as if …” And then they’ll tell you go buy the purses and expensive stuff, even if your bank account currently doesn’t substantiate it. That’s not what “act as if” means. “Act as if” means you hold the emotions as though you already have it. Stay in that excitement of waiting for your phone to ring for your new team members that you are bringing to you are calling you to tell you about the new product sales they just did, the new team members. Hold that through in putting together your calls each month. Hold together that contentment and the excitement when you open up or you see the deposits in your bank account because it’s not just your sales anymore. You have the passive income. It’s not so passive in that you’re encouraging other people, but they’re building and you’re getting from their building. That’s how it’s supposed to work. Now, if doubt pops into your head during this time when you’re already like, “I got it. It’s done,” then you just say to it, “Thank you, but that is already done.’ And I always think about, when doubt pops into my head, I think about Jesus on the cross, who said, “It is finished.” But, if the people there who heard him looked around, it didn’t appear as though it was finished, but I know he was very precise in his words, “It is finished.” So when doubt pops into my head, no matter what my reality says. I just simply state, “It is finished. Thank you very much, but it is done and goodbye,” because your thoughts will come in. And the last thing is take inspired action. We want to start sitting and making our plans especially if you’re a task master like me who tends to get workaholic personality. We want to create our plans. We want to create all of our tasks. I’m going to go to this many places and call this many people. And it’s usually more calls than we can make in a day. It’s more places than our car will drive in a day. We’ve created our really long list of everything we’re going to do. I’m going to tell you and go against the grain and say don’t do any of it. Do inspired action. I spoke last night because I had a dream saying ask this person to speak at their event for … you know. And it said it’ll be in July. So I said well, okay. I’ve never spoke for this company before. I never spoke in public on manifesting, but I was inspired to speak to her and I said, “Hey, would it be okay?” And she goes “Oh sure, I have time in June.” Okay, dream must be lying, right? No. She comes back and says, “Oh, I can’t do June. I want to put another speaker in. Can you speak in July?” Why yes, I can. Dream is never a liar. And I didn’t go and seek her out. I hadn’t even though to ask her. If I hadn’t had the dream and then took the action and the faith and leaped on the faith of the dream being accurate, I wouldn’t have spoken last night and I wouldn’t be speaking to you today. I couldn’t have made any of this happen because Tina and I just recently met face-to-face within the past week or so. So inspired action, it isn’t necessarily a dream. It could be. It’s an urge and everybody gets it differently. You either get a feeling that you need to go somewhere. You get an excitement of, “Oh you should post this on social media.” [inaudible 00:18:23] where you need to make a call. Oh, you should reach out and talk to someone. Just do it without hesitation. Don’t force it. It will absolutely come, as long as you believe. And hopefully all of this would inspire you guys, which is my hope for this call to truly say, “You know what?” Yes, it’s summer time. There’s a lot of people on vacation. But they’re eating themselves and they’re going to come back and want that energy back. They’re going to come back and want to lose a few pounds. I’m excited that they’re on vacation. I’m excited that there are people on vacation here in your area, wherever you’re at, and I’m gonna bump into them and they’re going to want to be part of my team. There’s no downside to any time of the year. I made money in the recession because I used law of manifestation. And I believe that each and every one of you can build the team to a level you desire. So hopefully that’s been helpful for you guys. Oh my gosh, I have a few pages of notes. I’ve got two pages of notes. Wow. Yeah, so I just want to bring up real quick too, you talked about I know … Let me look through my notes because I had a question and it just escaped my brain. You know, overcoming that doubt. Now, could you just share with us … that’s not something … I mean, we can be intentional about it but we have gotten this way. I know I’m 49, you know what I mean? I’ve gotten this way over the course of time. When those doubts pop in, being intentional about blocking them and turning it around, that’s going to take time. We need to not beat ourselves up if it doesn’t happen in that hour that we’re like having those doubts. No, no, no. I always said that my life is like a bumper cars. You know, I get too far from the left and God bumps me over. I go too far to the right and he bumps me over. But anytime something pops up, if you have a doubt or a fear, I say write it down. Don’t give it too much attention because you don’t want to keep bringing it about, but write it down and go general with it. So do you have any ideas of any doubts that you can think of off the top of your head? Even if it’s made up. And again, it comes back to, I’ve discussed with you before, is past experiences. So that’s something that pops into your head and then having that negative mindset of the fact that things that have happened in the past and that they continue to happen. And I’m going to use an example of me going for my next rank with my company recently is that every month I say, and every month we do … every month we set goals. We write them down, we share them with each other and say, “Okay, hold us accountable,” and halfway through the month, something happens. Then, three fourths of the way through the month, something happens and you give up and say, “Okay, let me try again.” And I have been doing that for over two years. So there’s a couple things actually. … do what I gotta do,” right. There was no other option. There was no Plan B. That was kind of cool. We have that a lot now. A lot of us struggle with that. Some people, flat out, they struggle with it so long that they finally just quit altogether. I hate for that. So how do you address that? Okay, a couple of things. Number one, if they’re consistently not coming, I would ask you, “Are you white hot? Not red hot, not fire that you see at the camp fire, but white hot, on fire, determined that it’s gonna happen?” Which is what you had just said you did on the Saturday when you crossed over. For the two years, were you on fire, determined you’re not gonna be moved, it’s gonna happen come hell or high water, as my grandmother used to say? That’s one thing. The second thing is, if you are determined, but then something comes in where things don’t appear that they’re moving forward and you give up, and that consistently happens, then shows a pattern in you that there’s a hidden driver there, which is what we were talking about last night. For me, it was something that was spoken to me in my childhood. I had a fear of success. My fear of success, we finally found out and were able to pinpoint it, was from age three to 13, I was consistently told by my grandmother that I would never amount to anything. Because of that, I could never make any goal I set for myself. No matter how badly I wanted it, I would always make the goal so big that I would give up. Like me wanting to be 123 pounds in a day from 168 … that kind of a goal. I set myself up for failure subconsciously because of, what I call, the hidden driver. So, if you see something consistently coming up, you gotta really look as to what’s the possibility? The book that helped me to determine that I had a fear of success was T. Harv Eker’s The [Secret of the] Millionaire Mind, which I recommend for any entrepreneur, which is what you all are, you’re business owners, to get this book, and it will take you through theories of his given analogy, and then ask you questions. The ones that you relate to are the ones that are gonna really pinpoint why you consistently come into this. In AA, and my ex-husband is AA and NA, and I went through the programs with him, the first step is acknowledging that this problem is here, but that’s not what helps anybody to stay sober, or to clear anything in their life. So the next thing I had to do is start journaling. Get all my emotions, empty myself out in my journal time. Write it down so that I could process it. Then to shift it out, I had to forgive my grandmother with an earnestness and love. And when people say, “I forgive you, but I will never forget,” that is not a Godly forgiveness. He says, “He has forgiven my sins, and he remembers them no more.” So, to me, that’s forgiveness, and it’s very difficult for people. But I have forgiven people who I am now friends with and able to have in my life, and others I have forgiven and said, “For me to be healthy I need to stay away from the person because they have issues, and that’s okay because that’s who they are.” Not an easy thing to do. In my case my grandmother had passed away in 2007, and I just got it in January this year. But I forgave her with deep love, and I only speak on it in a matter of fact way, not in a “I’m totally not gonna forget this” way. Very different heart. So, I will stand before anybody, God, universe, infinite source of possibilities, and I know I can feel well done, like a good and faithful servant today in spite of those words. Once I did that, my business starting picking right back up again. I had beat my goals. I didn’t meet them, I’ve exceeded them. And I hold to on to Ephesians 3:20 and 3:21 that says, “Above and beyond anything I could ask or imagine.” Because of that, it’s always this or better, this or more in an easy, relaxed, fun way. Does that help? I’m gonna stop now. You know what, Elizabeth, thank you, seriously. I know I took away … And I recorded this, so I’m going to send everyone the recording or I’m gonna post it on our team page, and I will also … I’ve got a million more questions, and I’m just grateful that I get to have one-on-ones with you anytime, or, lately, just have this friendship. I think I’m gonna learn a lot and I can share that with the other [inaudible 00:29:51], and I know that they all get it. So, I’m gonna wrap this up, and I thank everyone for your time tonight. I hope everyone took something so so profound away like I know I have, and I continue to do. And, I hope everyone has a very safe and wonderful wonderful Fourth of July. Boom boom. Don’t blow your fingers off with any firecrackers, and have a great night. And this call is officially over.